Today is our trip to Milford Sound. 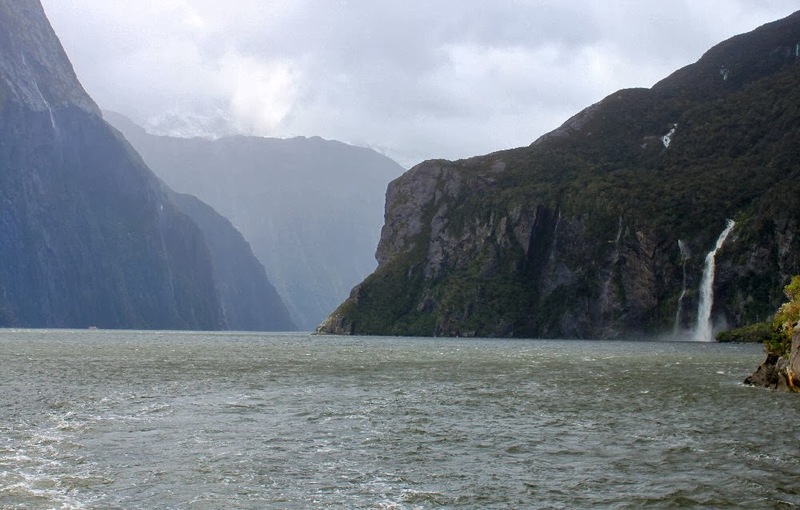 The southern end of New Zealand is full of fjords. They were named sounds but they are truly fjords carved out by glaciers long ago. On our cruise to New Zealand a few years ago, we cruised through the area and into Milford Sound. I remember it being as magnificent as the fjords in Norway. The forecast doesn’t sound like it will improve and we start out in rain. We have opted to take a tour bus for the two hour ride to the Sound. The roads can get nasty if the weather turns cold at those altitudes and if it does, chains are required for driving—that’s if the road stays open. Rather than take a chance on booking the scenic cruise through Milford and not being able to get there because of bad roads, the tour bus was a better deal. If they canceled for weather, we’d get the refund. The bus comes from Queenstown, another two hours north of us. When we board, we have a difficult time finding seats together until the driver asks some passengers to double up instead of sitting singly. The commentary from the driver is in English but there is a guide who is translating in Chinese for the large tour group that is aboard. We meet a nice couple from Indiana who sit behind us and swap football news. The advantage to the rain is that there are hundreds of waterfalls along the way to see—waterfalls that fall from so far up the mountains that you can’t tell where they begin. 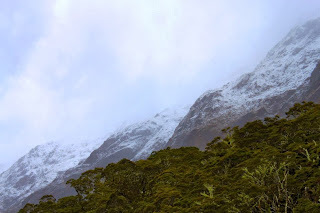 Soon we are right below the snowline of the mountain tops. After we pass through a long tunnel, we begin our descent to the sound and the dock for the scenic cruise boats. We arrive five minutes before the boat is ready to take off and hustle down to the one that is doing the nature tour. Actually the scenic and the nature tour boats take the same route minutes apart from each other. We’re not quite sure what the difference is unless it’s the commentary. Even before the boat is on its way, we have our box lunches and hot soup before us and enjoy every bite. Heading toward the Tasman Sea is a bit wild as we are going directly into the wind. Each time I go out to take a picture, I have to position the camera so the rain doesn’t get the lens wet. 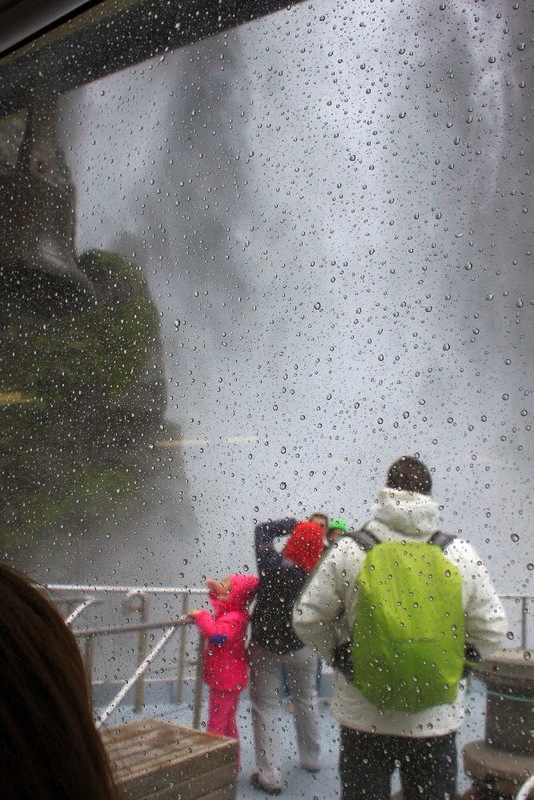 It’s not raining so hard now but the wind is blowing so strong that we surmise the “rain” is actually the mist from so many waterfalls that have sprung up with all the precipitation. The boat takes us to the first permanent waterfall, the Fairy Waterfall. It is huge throwing tons of water over the cliff and into the Sound. The captain tells his passengers that those who are brave and not afraid to get wet should stand on the bow of the boat. Slowly he noses the tip into the waterfall and eventually the half dozen people who braved the wind are scattered as the water hits the deck around them. 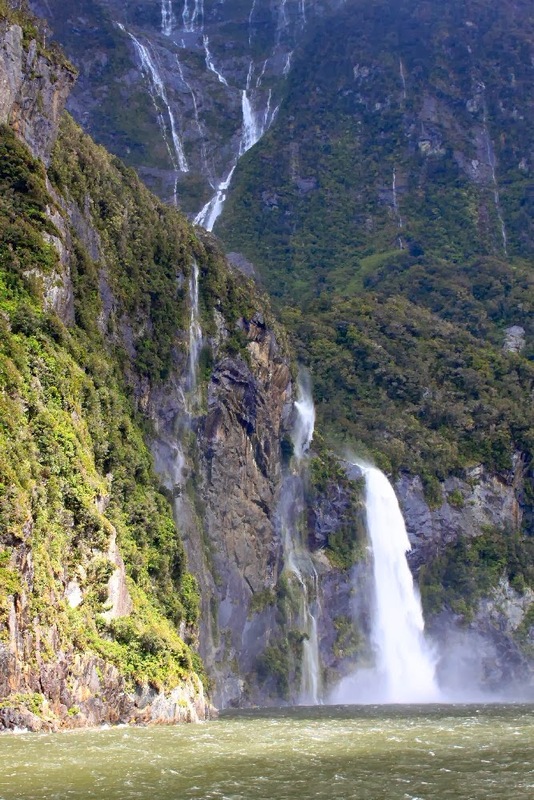 Our nature commentator tells us that the Fairy Waterfall is so named because the Maori claimed that if you went under the falls, you could see fairies dancing there. The waterfall is lacy and reminds me of layers of tulle on a wedding dress. The sun shines occasionally here and there as we make our way out to the Tasman. 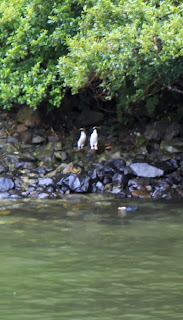 At the entrance to the Sound from the Tasman is a small island that is sacred to the Maori. It is prohibited to take any of the orange colored boulders from there. 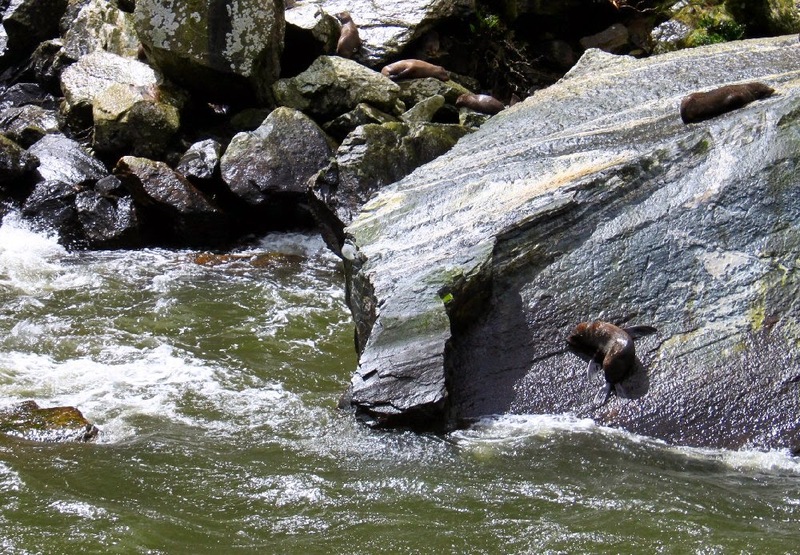 The boulders when cracked open contain the greenstone or jade that southwest New Zealand is famous for. Waves bounce the boat as we turn around to head up the other side of Milford Sound. There is no lack of waterfalls today. We stop near some rocks to see a seal or two resting. 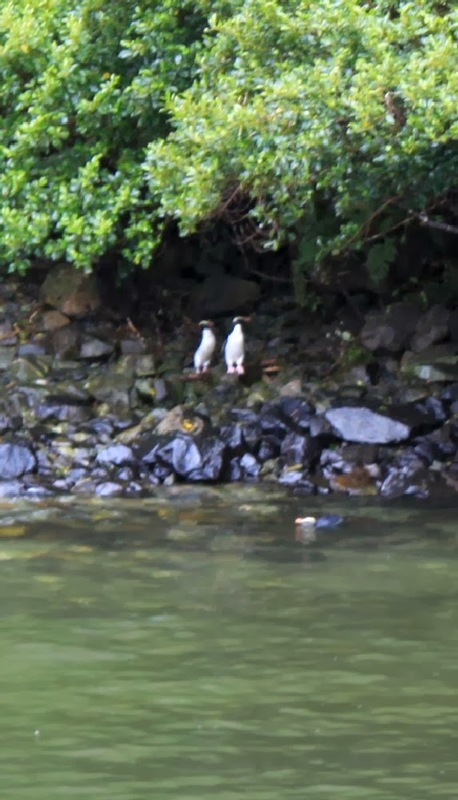 And then nearing the end of the cruise, our nature guide spots some penguins. The boat slowly edges near them as passengers vie for position at the bow to take pictures. Luckily I happened to be near there when the announcement is made and get a couple of good shots. One last large waterfall and a dousing for the brave who stand at the bow again and we are back at the dock area. There is a very nice ticketing building there with restrooms, a waiting area, and a gift shop. There may have been a café but we are in a hurry to get back to the bus and don’t explore. The majority of our bus passengers took the scenic boat trip and were due back before us. The bus driver asked that we not keep them waiting too long. 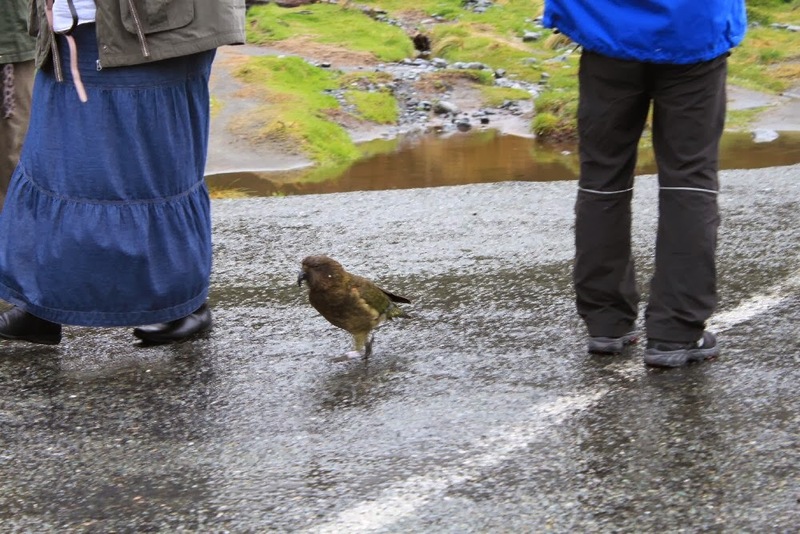 It is another long ride back to Te Anau. The little respite we got from the weather while on the boat doesn’t last and the rest of our bus trip is rainy and chilly. Still it is amazing to look up and see the towering peaks of snow covered mountains above us as we climb up to them and then go back down. I am so glad Bob hasn’t had to drive. We arrive in Te Anau about five-thirty and get off the bus thankful that we don’t have another two hours to ride as most of the others do who are going on to Queenstown. On the way back to the Shakespeare House, we take a moment to check out a place for dinner. We decide on a place called The Ranch which is a lot like a pub but has table service. They serve several different kinds of roast: lamb, beef, pork. The lamb roast comes with some roasted potatoes, cheesy cauliflower, a piece of roasted pumpkin and peas. A hearty and delicious meal at a great price of $20 NZD. We can’t believe our good fortune. Now if only the weather would get better.